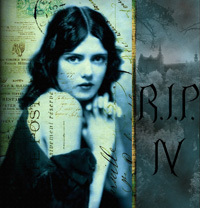 It’s the end of October which means the end of the chillingly enjoyable RIP IV Challenge. I have to say a big thank you to Carl at Stainless Steel Droppings who hosted this challenge because I have had so much fun participating (and even winning a beautiful set of postcards by the artist Jennifer Gordon who creates the most bewitching prints) and have found a bevy of new titles to add to my looong wish list. And…I put myself down for completing two books at first as I’m not good with pressure, but I ended up reading eight books (some of which also counted for the Japanese Literary Challenge 3) which even surprised me. I knew I read alot, but I didn’t realise I read that much, as these days I don’t tend to have big enough chunks of time put aside just for reading. I’m already looking forward to next year’s challenge! See you all then! You sure read some awesome books! it was a fun challenge was it not?!! you read some great books!! I hope you enjoyed them all as much as I enjoyed the ones I read! !